The PolyGeyser beadfilter is a real revolution in filter technique. Designed by the father of the Bubble Bead filter; Dr. Ron Malone. 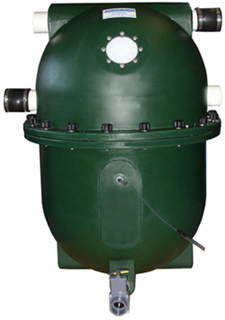 The PolyGeyser beadfilter is automatically self-cleaning without moving parts or electronics, contains EN (Enhanced Nitrification) media (see photo) that offers 50% to 100% greater nitrification than standard beads, and is capable of providing mechanical filtration down to 5 micron particle size. The PolyGeyser has the lowest possible pressure loss because it uses no multiport-valve. In and outlets are 3” (±75mm). It’s already being used in aquaculture, and now it’s ready for koi ponds. Water enters the filter in the middle of the chamber below the floating beads, and flows up through the beads and out to the pond. A pump, injects air into the collection chamber until it is full. The air is then released automatically up through the bed of beads, churning loose captured debris (this is the geyser part). The water pump continues to run. The beads fall to below the water intake, so the new pond water washes down through the beads to the chamber below. As the filter refills, the beads float up to the top of the filter, and the cleaning process is completed. The air pump can be adjusted to fill the chamber for automatic cleaning every two to six hours, keeping the filter media bed at an optimum performance level and debris free. In this way the filter can handle up to ± 2 kilo feed loading per day! In the bottom chamber of the filter , the captured debris settles out, and can be released by simply opening a valve at the convenience of the owner (normally every 2 or 3 days), however the chamber is quite large, so the filter can go for weeks without being flushed, and the flushing process uses very little water. The pump doesn't even need to be turned off to purge the collection chamber.